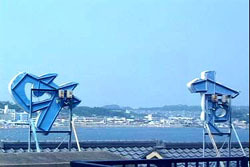 At Enoshima which is famous as a tourist spot, the Legend of Tennyo(Heavenly Maiden) has been passed down since the ancient times. What kind of Tennyo could she have been? 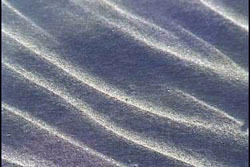 We will try to figure out its origin as we take a walk through the main sites within the island, starting with the local shopping area. Of course, we will check out the three branches of Enoshima Shrine, the botanical garden, the panoramic tower and the Oiwaya. You will also get to see the goddess Benten and the Enoshima History Scroll, which recounts the legend in its most reliable form to the people of today. 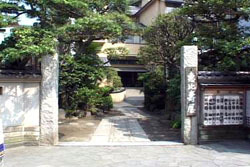 Please fully enjoy Enoshima's rich traditional past, filled with history and romanticism. 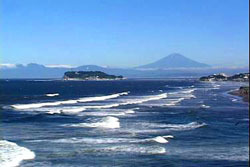 Since ancient times, Enoshima has been a religious island. 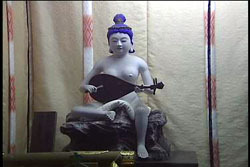 The goddess Benten (or Sarasvati) is especially famous here. 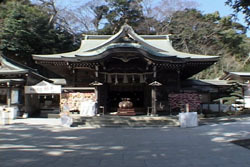 In the Edo period, the Enoshima shrine was visited by many believers from Edo (or presnt Tokyo). Also, there is a legend that a Tennyo, landed on the island. What kind of Tennyo could she have been? 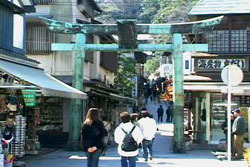 After you cross the Enoshima Ohashi bridge and pass under the bronze shrine gate, you will see the busy local shopping area. 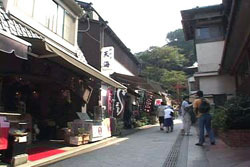 The Ebisuya is the oldest inn in Enoshima. 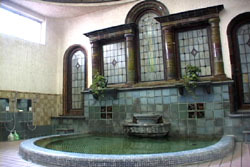 There is also the Iwamotoro, which is famous for its classical Roman-style bath, which used to control Enoshima as the Iwamoto-in, before the Meiji Restoration. 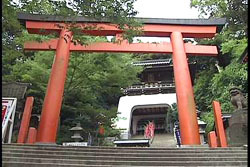 When you further move on, you will hit the entrance of the Enoshima Shrine. It is exactly like the Ryugu or the Dragon Palace. Could it be that the Tennyo had some sort of relationship with the princess OTOHIME of the palace? 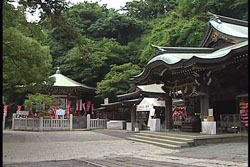 At the Enoshima Shrine, there are three branches and three goddesses that are the guardian gods of the sea are enshrined there. 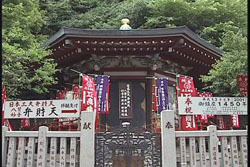 Hetsunomiya is a shrine, which was formally called the Shimonomiya. 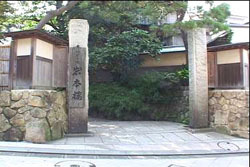 Next to Hetsunomiya is the Hoanden, where two goddesses are enshrined. 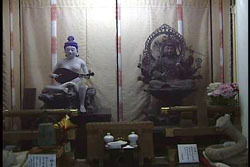 Both, Happi Benzaiten with 8 hands and Myoon Benzaiten with a biwa are representative figures of the goddess Sarasvati. the goddess Benten was enshrined from the Chikubushima of Omi at the request of the Shogun, Minamoto no Yoritomo. 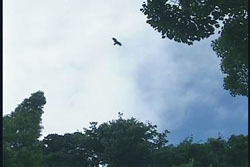 Since then, it has been called the Enoshima Daimyojin and was strongly worshipped by the shogunate and the Hojyo clan. 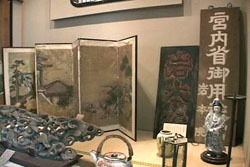 In the Edo Period, a lot of people visited Enoshima, since she had become popular as the goddess of fortune and happiness and for the performing arts. However, in the Meiji period, the policy separating Shinto and Buddhism was enacted. 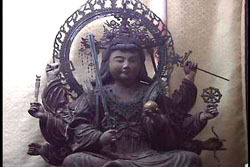 Since the goddess Benten was originally a Buddhist deity, as she is recognized today, she was perceived as something different from the gods of ancient Japan. 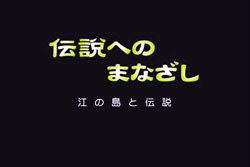 (C) 2006 DAILY WORK Co., LTD. All rights reserved.